Ship Weight : 3 lbs. 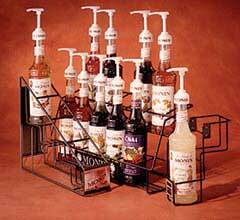 Ship Size: 5.5" x 16" x 13.5"
Product Size: 4" x 15.5" x 12.5"
This is a durable metal rack. Holds 4 Monin bottles.